There is truth to the saying that you can’t build your way out of congestion. This is true for highway and for on-street parking. Late last year, the Township of Langley expanded 80th Avenue in Willoughby by removing temporary curb parking. This caused an uproar with some people in the community who claimed there wasn’t enough parking in the area. Interesting enough, the Township has the highest off-street/on-site residential parking requirement of any municipality in Metro Vancouver. You can read more the history of parking in this area of Willoughby on a previous blog posts. Anyway, the Township commissioned a study to see what was really going on in the community. Survey area, near 80th Avenue west of 208th Street. Select image to enlarge. Parking Accumulation by Zone, Weekday Time. Select image to enlarge. 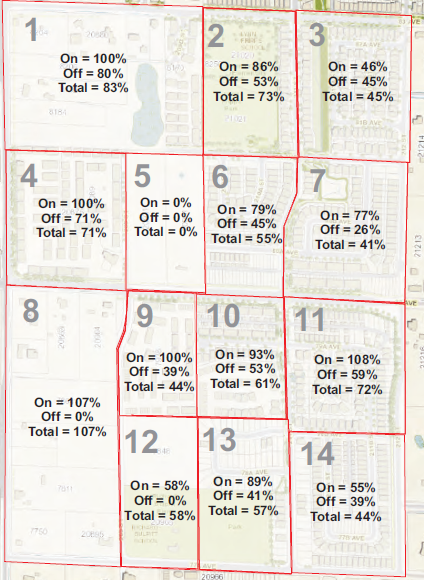 Parking Accumulation by Zone, Weekend Time. Select image to enlarge. 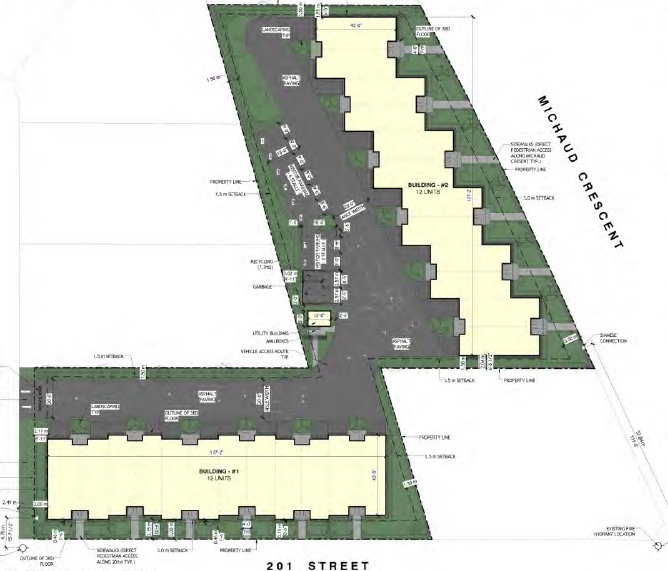 As you can see from the proceeding graphics, while on-street parking is certainly oversubscribed in some areas, there is ample off-street/on-site parking available throughout this part of Willoughby. The survey measured vehicles that were parking in driveways, but did not count vehicles that may have been parked in garages as it is a well-known fact that many people use garages for anything but parking vehicles. 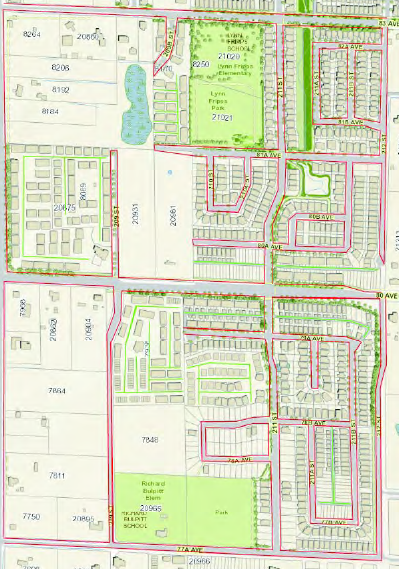 As a result of this report, Township Staff is recommending no changes occur in existing neighbourhoods. They are suggesting that more on-street and off-street parking be built and required in future neighbourhoods. Increasing parking supply will increase the cost of homeownership, and the cost to build and maintain roads in the Township. Everyone will pay more to live in the Township. Increase parking supply will also impact the future accessibility of the community. As parking supply isn’t the problem; there is enough off-street/on-site parking and only some areas have on-street parking over-subscription. The real solution is to manage the demand for on-street parking where it is required. This would encourage people to use the already provided on-site parking. Of course there would be enforcement costs, but these costs could be recovered. The Township could implemented a permitting system for example. On-street parking is a limited resource. The Township of Langley needs to look at managing it better considering that there is an ample supply of off-street parking today. As I posted about a few weeks ago, the City of Langley has been planning to build a new Timms Community Centre, directly west of City Hall, for several years now. Steve Jobs would have been proud about the lack information made available to the public about this $14.3 million project until the City of Langley revealed the new community centre design yesterday afternoon. Artist rendering of new Timms Community Centre, looking from Douglas Crescent. Select image to enlarge. The new 35,000 sq. ft., two-storey facility also includes one-level of underground parking. 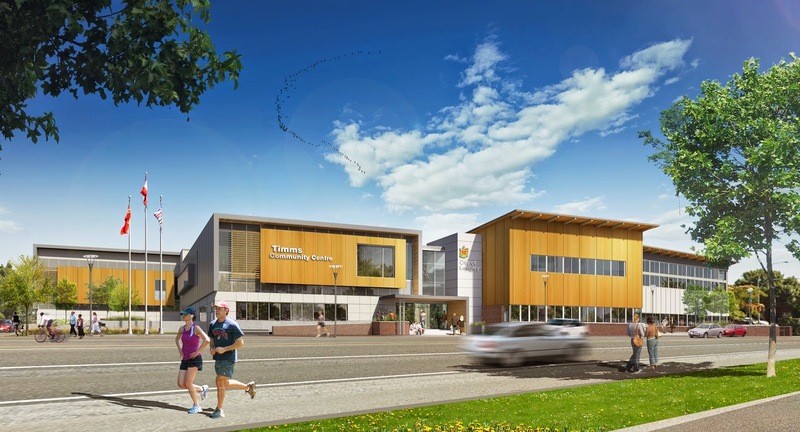 The new Timms will include a full-size gym, walking track, fully equipped fitness centre, a community kitchen, and plenty of flexible room/community space. The design of the centre is to truly be a community hub. One of the challenges in the City today is a lack of flexible community space, so I’m glad that this is addressed in the community centre design. Site plan for new Timms Community Centre. Select image to enlarge. Timms fronts Douglas Crescent and is fully pedestrian and cycling-friendly. In fact, I’m happy that there is very little surface parking. Now there is surface parking in the back of the building which unfortunately fronts Fraser Highway, but it is my understanding that this is temporary. I’m hoping that Council and City staff will work quickly to improve the public realm along Fraser Highway; replacing the surface parking with a better, more pedestrian-friend land use. Overall, I’m very impressed with the new design for the Timms Community Centre and I believe it will have a positive impact in Downtown Langley and provide a much needed social hub for people, including seniors and/or people with lower incomes, who live nearby. The new Timms is expected to be completed by December 2015. Before I get into today’s topic, I wanted to clear up some terminology. A rowhouse is a single family unit constructed in a row of attached units separated by property lines. If you live in a rowhouse, you are not part of a strata plan. A townhouse is exactly the same as a rowhouse except that it is part of a strata plan. In the South of Fraser, most rowhouses are townhouses as they are in strata plans. When most people think of rowhouses, they imagine two- or three-story units that run continually along a street front. Maybe images of Philadelphia come to mind. But, rowhouses can take other forms. For example, they could be single-story duplex units. During the 1990s many townhouse developments were single-story units that turned their back to the street. They were usually only accessible by a gated private road. For a whole host of reasons, municipalities discouraged these gated developments. At the same time townhouses started to resemble the traditional three-story form, but with a catch. The townhouse’s front and centre feature was the garage door. Also, most townhouse projects were designed with their backs against the street and private laneways required to access the units. These designs did very little to improve the public realm. As these units are inward focused, it inhibits “eyes and ears” on the street which is key to improving perceived safety. Also as people’s front yards are driveways in these inward-focused designs and backyards are cut off from the street with large fences, there is very limited pedestrian-friendly mixing space which limits street life and the ability of people to serendipitously encounter their neighourhoods. These design decisions make it harder to build a vibrant and healthy community. One of the good things about the City of Langley is that many of the townhouse projects built since the early twenty-first century, actually front the street. The one major issue was that the garage was still the most prominent feature. 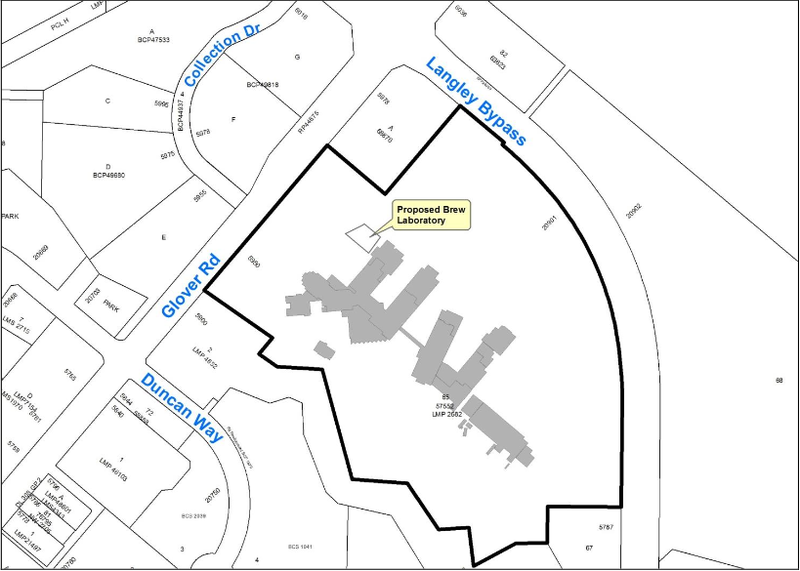 At the last City of Langley Council Meeting, two new townhouse projects were on the table. The great thing about these projects are that they have small front yards, and the garage is actually accessed via a back laneway. These townshouses will contribute to the creation of a better public realm and should enhance the quality of neighbourhoods. Street view of proposed townhouse project at 19690-19720 55A Avenue. Select image to enlarge. Site plan for proposed townhouse project at Michaud Crescent and 201 Street. Select image to enlarge. Street view of proposed townhouse project at Michaud Crescent and 201 Street. Select image to enlarge. Going forward, the City of Langley should require that all townhouse projects have some units that must front the street with garages accessed via laneways. This design will create great walkable communities. Of course one of the keys to building walkable townhouse (or rowhouse) communities is that there must be shops, services, jobs, and transit within easy walking distance. The two projects before Langley City Council are within an easy walk of Downtown Langley and frequent transit. Three-storey townhouses/rowhouses are a great form of “single-family” style housing and can help support the creation of walkable, accessible communities, designed to put people first. Over the past decade, researcher have started to study in earnest the link between physical and mental health, and the built-form of the communities and neighbourhoods that we live in. Last year, I posted about as research TransLink commissioned and complied on the links between land-use, transportation, and human health. This research suggested that people who live in walkable neighbourhoods with access to transit are healthier than people who live in auto-oriented areas. The Vancouver Coastal Health Authority, Fraser Health Authority, and the eHealth Strategy Office at the University of British Columbia have teamed up to create the My Health, My Community project. As part of the project, they are asking people over the age of 18 in Metro Vancouver to complete a survey. The survey gathers information about the physical health, mental well-being, eating habits, transportation patterns, and neighbourhood characteristic of its participants. The following one minute video explains things in a bit more detail. Once the survey results are complied, My Health, My Community should have a better understand of the complex links between health outcomes, our lifestyles, and where we live. The end goal of the project is to provide recommendations on how to build communities that improve our physical health and mental well-being. My Health, My Community is seeking to get people from all parts of the region to complete their survey. While they have a high-level of participation from most parts of the region, they need more people to participate in the South of Fraser. I completed the survey in about 15 minutes this morning. The survey asks for some very personal information, but you can choose to not answer some questions. Since this survey is run by provincial health authorities, they already handle your sensitive personal information. The survey is open until June 30th and you could win Apple products. More information about the survey is available on the My Health, My Community website. Back in April, I posted that transit ridership was down in 2013. This was the first time that transit ridership dipped in our region for a decade. 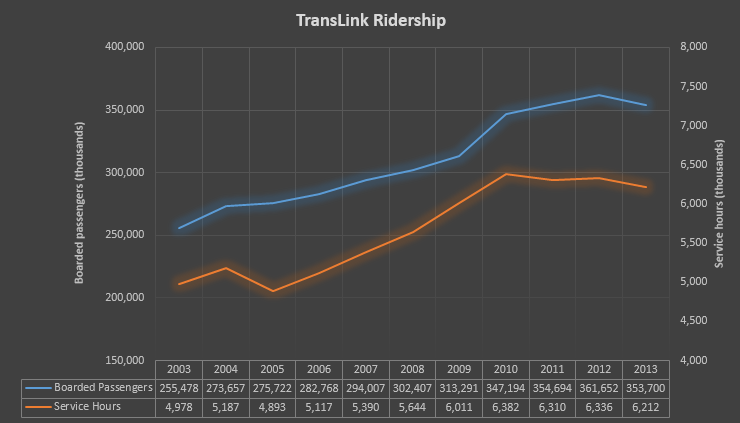 TransLink Ridership and Service Hours, 2003 to 2013. Source: TransLink Annual and Statutory Annual Reports. Select graph to enlarge. As you can see from the previous graph, there is a direct correlation between transit service hours provided and transit ridership. It is no surprise that more transit service attracts more riders. After the Olympics, TransLink could no longer afford to expand service. Transit service hours delivered have declined since 2010. With a relatively stable amount of transit service hours delivered between 2010 and 2012, transit ridership continued to climb until 2012. In late 2012, the province forced TransLink to aggressively “optimize” transit service in Metro Vancouver. This optimization resulted in larger cuts to service hours delivered. These cuts continue in 2014. The American Public Transportation Association compiles ridership statistics for transit agencies throughout Canada and the US. They recently released ridership statistic for the first quarter of 2014; things don’t look good for Metro Vancouver. In the first quarter of 2014, transit ridership was down 3.3% from the same period in 2013. There were 2,868,600 less transit trips between January and March 2014 than between January and March 2013. TransLink has cuts HandiDart service hours more drastically than regular transit service hours. As a result, there was a massive 8.3% reduction in ridership in the first quarter of 2014 compared to the same period in 2013. Some people might point to declining ridership as a reason to not invest in transit. I would argue that these statistics prove that more investment is needed. Increasing transit service hours delivered increases transit ridership. This show there is a demand for transit. The fact that reducing transit service hours result in less ridership shows that the system is running as efficiently as possible. Any excess transit capacity was absorbed between 2010 and 2012. With transit service being reduced, our region is becoming less accessible. For example, some people will start to have a harder time accessing jobs in our region. Improving transit is critical for the success of our region. One community that has continued to invest in transit service is Calgary. In 2003, Calgary had an average weekday ridership of 172,100 on their light rail system. In the first quarter of 2014, average weekday ridership of their light rail system was 309,900. In Metro Vancouver, SkyTrain’s average weekday ridership for the first quarter of 2014 was 361,500. This is interesting considering that Metro Vancouver has double the population of Calgary. The mayors in Metro Vancouver have released their vision for transit in our region, but the Province of BC continues to hold back transit improvement. Until the province approves a new funding source to pay for transit expansion, I fear that transit service hours delivered and the accessibility of our region will continue to decline. The Township of Langley is currently in the process of creating a new Recreation, Culture, and Parks Master Plan. The plan will be the foundation for the delivery of recreational, cultural, museum, library and parks service for the next decade. The Township is in the early stages of preparing this document and is looking for feedback from the community. The Township is interesting in what motivates people to take advantage of recreations and cultural opportunities, what Township provided services people are already using, and in what ways people think that services could be improved. The Township is also look at people’s willingness (or not) to pay for improved services. If you live in the Township of Langley, the Township is seeking your feedback. They have put a survey online that should take about 15 minutes complete. The survey will be open until July 18. If you complete the survey, you can enter a draw to win a three month family pass to be used at any Township operated recreation centre. This is a $300 value. There are two major demographic trends that are having a big impact on the future of cities and regions in North America. One trend is the rising average age of our population, and growing absolute number of seniors. The other trend is that Millennials, one of the largest age cohorts since the Boomers, want to live in urban communities and have turned away from suburban living. Interesting enough, seniors and Millennials have very similar aspirations for where they want to live; it is fundamental Smart Growth. Cities and regions that turn these aspirations into on-the-ground community design will thrive. Communities that don’t will have a hard time. Seniors are supported to be active and engaged in their community and engagement practices are in place to prevent isolation. When you dive deep into the strategy, one of the roles of Surrey (and any community) is to build an accessible public realm. This means creating safe and welcoming streets. It also means designing the public realm considering people who need mobility aids. This is one of the reasons why Surrey now requires wider sidewalks. On top of that, Surrey will needs to ensure it provides high-quality public service likes libraries and community centres. One of the key tenets of Smart Growth design is to provide a variety of housing types at different price points. Surrey’s strategy focuses on ensuring there is affordable housing. It also focuses on building housing that can be adapted for people with disabilities or mobility challenges. Another focus of the strategy is to connect seniors with shops and services by designing walkable communities that support cycling and public transit. Building an age-friendly community supports people at all ages in life. If Surrey is successful in implementing their age-friendly strategy, it will create a community that will support seniors and attract Millennials that want to live in Smart Growth communities. While East Vancouver may be getting all the attention lately with the rising popularity of craft brewing and the consumption of craft beer in Metro Vancouver, the South of Fraser can hold its own. The South of Fraser is home to Big Ridge Brewing, Russel Brewing, Four Winds Brewing, Stanley Park Brewery, Dead Frog Brewery, and Central City Brewing + Distilling. Speaking about Central City Brewing, they recently vacated their current brewing facilities at the Central City Mall, moving to their new $20 million facility near the Scott Road SkyTrain Station. This facility was built in partnership with the municipally owned Surrey City Development Corporation. 20901 Langley Bypass. Proposed site of Kwantlen Polytechnic University's brewery. Click image to enlarge. As Central City Brewing no longer need their Central City Mall facility, SFU will be taking over the location as part of their new brewing program. As the SFU Surrey campus is in the same building, this makes sense. Not to be left out, Kwantlen Polytechnic University will be expanding their new brewing program in the City of Langley. Kwantlen has applied to the City of Langley to build a 4,510 sq. ft. brewing instructional laboratory near the Glover Road entrance of their Langley Campus. You can have your say on this proposal at a public hearing scheduled for 7pm on June 23. Besides being home to some great craft breweries, the South of Fraser will become the training hub for brewing in Metro Vancouver. Improved bus service along Fraser Highway, faster service to Aldergrove. One of the most used transit corridors in Metro Vancouver and the busiest transit corridor in the South of Fraser is along Fraser Highway. Service along this corridor is primarily provided by the 502 bus route and with supplementary service by the 320. During peak periods, other routes augment these services. 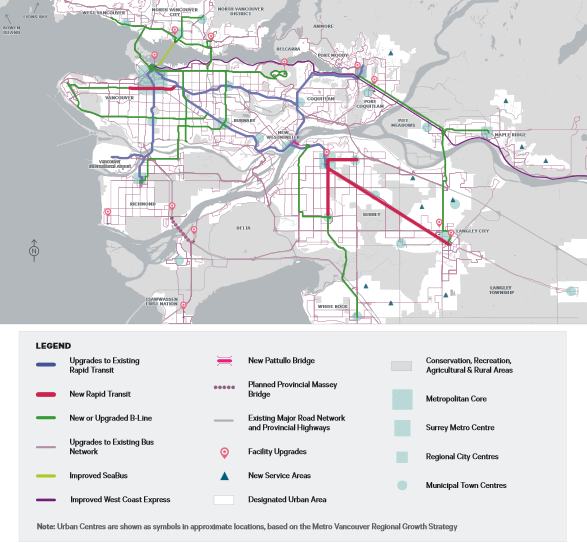 Last week, Metro Vancouver mayors released their transportation vision for the region. One of the interesting facts is that light rail will be built on the King George Boulevard/104th Avenue corridor before the Fraser Highway corridor. 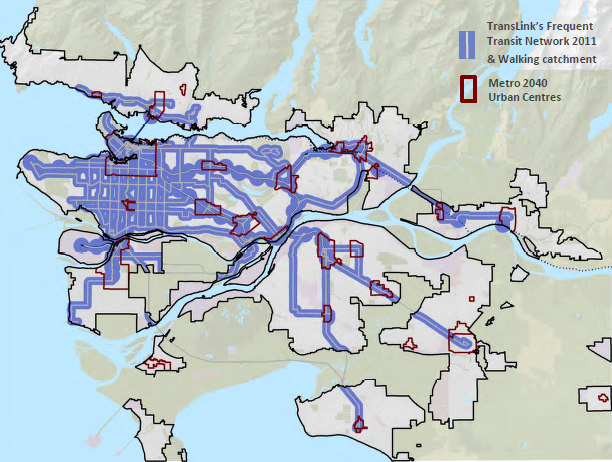 This is interesting because the Fraser Highway corridor is the more congested corridor. Due to this congestion, service will be improving along the Fraser Highway corridor next week. On June 23, a new route will be added along Fraser Highway. The 503 bus route will run local service between Aldergrove and Langley Centre. Heading towards Surrey Central SkyTrain, the 503 will have drop-off only service at key stops. Heading from Surrey Central, the 503 will only provide pick-up only service at key stops until Langley Centre. This new route will run about every 30 minutes for most of the day. The new route will shave about 10 to 15 minutes off the trip between Langley Centre and Surrey Central. Map of 502/503 bus service through Langley. Select map to enlarge. 502 bus service will be improved with service every 15 minutes most of the day and up to every 5 minutes during peak travel periods. Some 502 trips will still service Brookswood during peak travel periods. Aldergrove buses used to divert through Salmon River/Uplands twice a day. This wasn’t very useful to most passengers, resulting in longer trips for Aldergrove bus riders. The new 503 service is eliminating this diversion. With these changes starting next Monday, transit service will be improved along the Fraser Highway corridor. Because this is part of TransLink’s service optimization plan, it is coming at the expense of service in other parts of the region. Yesterday, the Mayors’ Council on Regional Transportation released their vision for transportation in Metro Vancouver. This was in response to the demands by the province to come up with a fully funded transportation vision for the region by the end of the month for the transit referendum that the province is hell-bent on having. The mayors’ vision is very similar to the Leap Ahead Transit Plan that Paul Hillsdon and I released last fall. Unlike our plan, the mayors’ vision spells out the funding needed to maintain our regional roads, build the cycling network, and improve the base bus network. In fact, the mayors’ would like to increase cycling network funding from the current $1.5 million to $16.5 million. Other main differences are that the SFU gondola is missing and the UBC Subway is truncated at Arbutus. The mayors’ council has a two page fact sheet which outlines the improvements envisioned. Map of specific transportation investments identified for implementation in the first decade of the mayors' vision. Click map to enlarge. I talked about the vision on Global’s BC1 yesterday afternoon. Like our Leap Ahead Transit Plan, the mayors’ vision relies on the province and federal government to pay for 2/3rds of the major capital projects. To pay for the rest of the vision, the mayors proposed a stepped funding plan. In the first six years of the plan, an additional annual $110 million in new revenue would be needed. This would step up to $275 million by year seven, and top out at $390 million annually by year 12. This would require two new funding sources to pay for the vision. The first funding source preferred by the mayors is for the province to return the carbon tax collected in Metro Vancouver back to the region to pay for transportation improvements. This would be on top of 3% annual increases in property tax and increased fare and toll revenue. As this would impact the province’s revenue, it took all of six seconds for Minister of Transportation and Infrastructure Todd Stone to reject this idea. The mayors’ also suggested a higher carbon tax for Metro Vancouver as a “Plan B” first funding source. Minister Todd Stone suggested that the province could support that idea. The second new funding source suggested by the mayors to pay for improving the region’s transportation network is road pricing. This would kick in around year seven of the plan. With road pricing in place, gas tax would be reduced by 6ȼ per litre. The fact that all of Metro Vancouver’s mayors (with the usual exception of Burnaby Mayor Derek Corrigan) endorsed this vision is impressive and shows how well our region’s federation of local municipalities work. In the vision, the region’s mayors have settled on a four-lane tolled replacement for the Pattullo Bridge. Surrey was pushing for a six-lane replacement while New Westminster wanted a four-lane replacement. This has delayed replacing the bridge for several years. Taking a page from the province who built the Alex Fraser and Port Mann Bridge to not preclude light rail going over them in the future, the mayors' vision for the new Pattullo Bridge is that it will be designed to not preclude its expansion to six-lanes in the future. With the release of this vision, the mayors’ have thrown the ball into the province’s court for funding a sustainable transportation network in our region. The province will have to decide if it will move forward with the referendum based on the mayors’ suggestion of a new regional carbon tax. If the province does not move forward with a new regional carbon tax, does Christy Clark have a “Plan B”? If the province does move forward with putting a new regional carbon tax to a referendum and it fails, is there a “Plan C”? If new funding for building a sustainable transportation network is not approved, getting around our region will become increasingly harder to do. This will impact the economic prosperity and quality of life for people who live in Metro Vancouver. Metro Vancouver’s Regional Growth Strategy is meant to guide the development of our region. The provincial government requires our region to have a growth strategy. The strategy has five main goals: create a compact urban area, support a sustainable economy, protect the environment and respond to climate change impacts, develop complete communities, and support sustainable transportation choice. Each municipality’s official community plan in Metro Vancouver must reflect the goals of the regional growth strategy. Besides outlining the vision for the region, the growth strategy also explains how the strategy will be implemented and monitored. As part of the monitoring requirements, Metro Vancouver is currently working on its first annual progress report on the regional growth strategy. The progress report contains performance indicators for the last two years, using 2011 as a baseline. 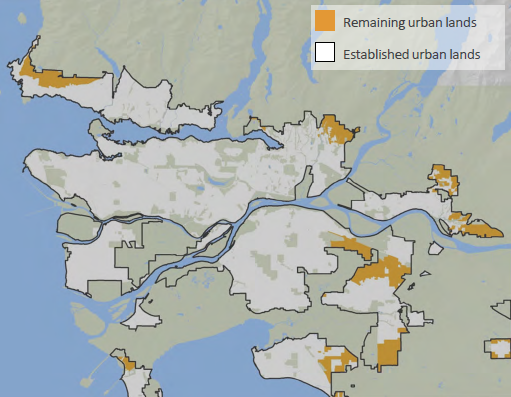 While the report has yet to be released, some preliminary information was made available through a presentation delivered to the Metro Vancouver’s Regional Planning and Agriculture Committee last week. One of the interesting facts is that out of the 20 municipalities, treaty First Nations, UBC, and the University Endowment Lands, only the Township of Langley has not had its regional context statements approved by Metro Vancouver. Regional context statements show how a municipality’s official community plan supports the goals of the regional growth strategy. Is the Township becoming a lone wolf in the region? Since 2011, there is more agricultural, conservation, and recreation land in the region which is good news. One of the goals of the growth strategy is to protect the industrial land base, but since 2011 there has been a loss of 60 hectares. 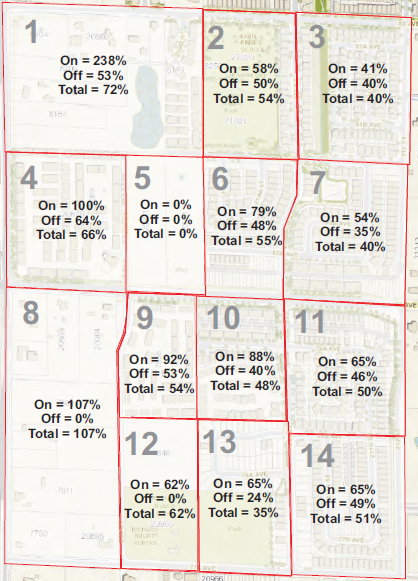 Regional land use designation changes, 2011-2013. Select table to enlarge. Surrey is where close to one-third of region's growth will occur, so it is important that this community grows in a sustainable fashion. Surrey’s slogan is “the future lives here” and that is the truth. One of the things that some people say is that there is no more land for development in our region, using this as an excuse to develop on farmland. This is simply not the case, in 2011 there was 7,900 hectares of land that could be developed within our region’s urban containment boundary. Between 2011 and 2013, 235 hectares or 3% of that 7,900 hectares was developed. Established and remaining urban lands within the Urban Containment Boundary, 2011. Select map to enlarge. Currently 55% of our region’s population has access to frequent transit service. This means 15 minute or better transit service, most of the day. 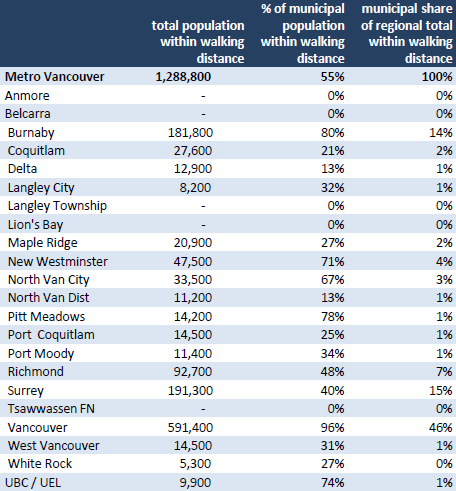 As shown in the following table, almost all of Vancouver and most of Burnaby have access to frequent transit. Access to the frequent transit by municipality, 2011. Select table to enlarge. In Surrey, only 40% of the population has access to frequent transit service. As Surrey is the faster growing municipality in the region, it is imperative that more high quality transit service be delivered to that community. Areas of Metro Vancouver within walking distance of the frequent transit, 2011. Select map to enlarge. The full progress report should be available this fall. The Timms Community Centre is one of the largest infrastructure projects that the City of Langley has undertaken in recent memory. Talk about replacing the community centre has continued since I can remember. The City of Langley started putting aside funding for the replacement of the centre since at least 2010. The former Timms Community Centre was located next to the current City Hall, but was demolished in December 2011 to make way for its replacement. Timms Community Centre was temporarily relocated to Eastleigh Crescent. It is now June 2014, and the new Timms Community Centre remains allusive. In the meantime, the cost for the project has slowly crept up. In 2012, $2.4 million was added to the project to build more parking spots. Currently, the total budget for the Timms Community Centre replacement is $14.3 million. In the latest council agenda, it was revealed that the City has spent $111,672 from January 1, 2012 to December 31, 2013 on consulting fees for the project. While $111,672 isn’t a large sum of money in the overall project, there has been little to no community consultation about the Timms Community Centre replacement project. From what little is known, the original plan was to build a conventional community centre. Later on, the plan shifted to building a “community hub.” Besides the traditional components of a community centre, the idea was to include other community services in the facility. For example, Fraser Health’s Public Health Unit and other service organization could lease space and help build the centre. This would have increased the size and scope of the project. I think this would have been a great idea, but these plans fell through. Timms is once again back to being a conventional community centre. One of my main concerns about the Timms Community Centre replacement project is that there has been little public involvement. Unlike the Aldergrove Community Centre which had public involvement from day one, not even a concept drawing of the proposed new Timms Community Centre is publicly available. As one of the largest projects undertaken by the City of Langley, more information about its replacement should be made public. Right now there is a lack of transparency about what is happening with Timms. As Timms is a community centre, shouldn’t the City be getting feedback from the community on what our vision is for the centre? In the heart of Downtown Langley, there is a massive parking lot. The Cascades Casino’s parking lots fronts both Glover Road and Fraser Highway. This creates a pedestrian “dead zone” and detracts from the public realm in Downtown Langley. In simpler terms, it doesn’t create a place where people want to be. The one redeeming feature is Innes corner, a public plaza, at the corner of Glover and Fraser Highway. This plaza breaks up the parking lot and enhances the public realm. Unfortunately, a highway-sized sign advertising the casino is the most prominent feature of the plaza. Many thought that the casino would help revitalize Downtown Langley, but as I posted about last year, this has not happened. The first major challenge is that the casino’s parking lot and not the casino, front the sidewalks in Downtown Langley. The second challenge is that casinos by design are inward focused; the whole idea behind a casino is to keep people inside and gambling. This is reflected in the architecture. While the casino has not helped directly revitalize Downtown Langley, the casino’s contribution to the City’s revenue has helped pay for many capital projects like new parks and overpasses in the community. Gateway Casinos, the operator of Cascades Casino in Downtown Langley, has recently applied to build a new pub at the casino with an outside patio. View of proposed outside patio for new pub at Cascades Casino. Select image to enlarge. While pubs with street-fronting patios are a great way to both enhance and activate the public realm, due to the siting of the casino, the pub with outside patio that Gateway Casinos is proposing will not enhance the public realm. In fact because the surface parking lot around the casino is so large, you’ll hardly be able to see the patio from Fraser Highway or Glover Road. View of proposed pub at Cascades Casino from Fraser Highway, across the surface parking lot. Click image to enlarge. While I have no issue with the casino expanding its food service offering, it is unfortunate that this proposed new pub will not enhance Downtown Langley's public realm. 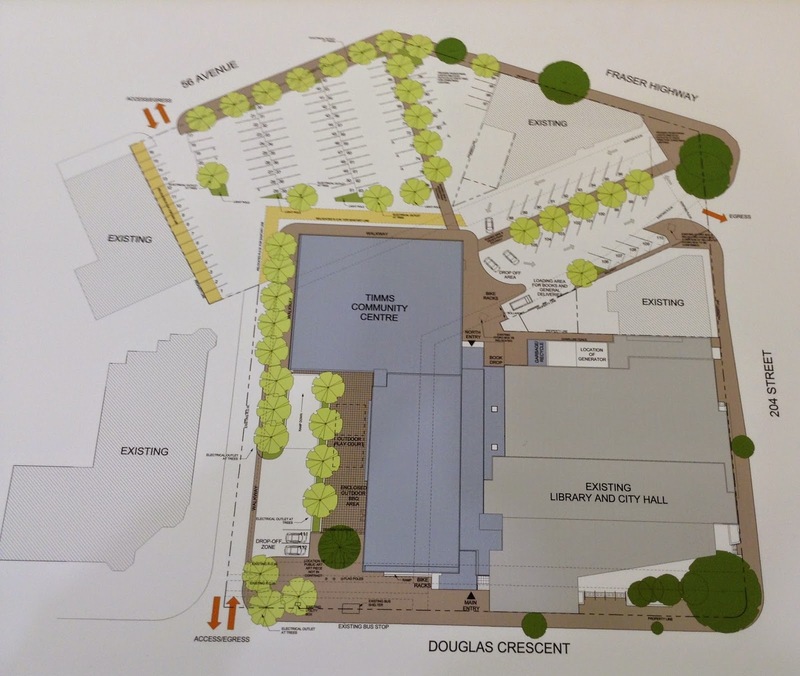 In order to actually enhance Downtown Langley around the casino, the City of Langley would need to work with the casino to find a way to reclaim the surface parking that fronts Fraser Highway at a minimum, replacing it with shops and services. There are certainly ways to go about this that would both help revitalize Downtown Langley and retain parking for the casino. TransLink has been working towards implementing a smart card fare payment system to replace the current system of cash, tickets, and passes. Funding for this program was announced in April 2009. Along with implementing a smart card system, TransLink was forced to install expensive faregates at SkyTrain stations by the province. This made TransLink one of two agencies in North America (the other being Los Angeles’s Metro) to move away from a proof-of-fare system for rail-based transit. Smart cards are replacing traditional payment on transit systems throughout the world. Along the west coast of the US, Seattle, San Francisco, and Los Angeles transit agencies current use smart card systems. All these transit agencies had delays in implementation their smart cards systems due to the challenges of rolling out a technologically complex system. Though once the smart card systems got implemented, the experience of using transit greatly improved. You simply tap your card to use transit, and the system figures out the rest. In Metro Vancouver, the cost of implementing TransLink’s Compass Card system has increased from $171 million to $194 million. In addition, the system’s full launch date has been delayed. This is not surprising as other transit agencies have faced similar challenges. As I’m in Calgary this week, I thought I’d highlight Calgary’s smart card system. Calgary Transit is also implementing a smart card payment system. Unlike TransLink which uses a zone-based system which requires tapping-on and tapping-off when using transit, Calgary Transit uses a simpler flat-fare system. Calgary received funding to implement its smart card system back in 2010. As Calgary Transit wasn’t installing costly fare gates and has a simpler fare structure, the system was supposed to be in service by June 2012. The original price tag for the project was $8 million. The system was not in service by mid-2012 and due to problems with implementing the system, Calgary Transit cancelled the project. Last late year Calgary Transit relaunched its smart card fare payment project. The total cost of the project could rice from $8 million to $19 million. A date has not been determined for when the system will go live. TransLink’s major issue with the Compass Card system appears to be with the time it takes for smart cards to be read when tapped on a bus. Once that issue gets resolved, it appears that TransLink will be able to roll out the system to more transit users. While delays and cost increases are never good, TransLink is unfortunately not the first transit agency to experience challenges implementing a smart card fare payment system. When I graduated from High School, instead of escaping to Vancouver for post-secondary education, I ended up in Calgary. This week I’m back in Calgary for work. It is amazing to see some of the changes in the community since I left over 10 years ago. When I lived in Calgary, its downtown was full of offices, but hardly anyone lived downtown. After 6pm, there wasn't a person to be found on the street. Today, there are more condos. People are cycling, walking, and enjoying life in downtown after 6pm. While not without some controversy at the end of April, Calgary City Council voted to build separated bike lanes in their downtown core. There is consensus that the future success of Calgary depends on improving cycling, walking, and transit accessibility. 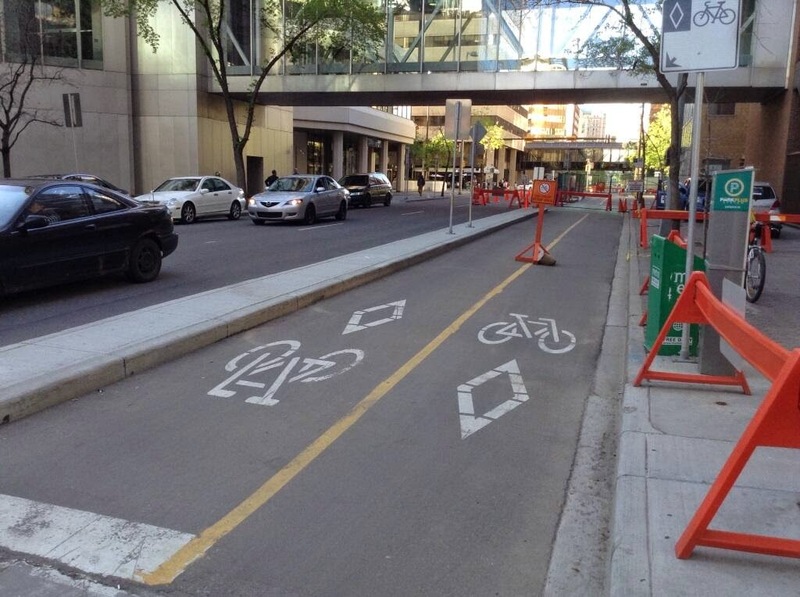 Seperated bike lanes under construction in Downtown Calgary. In Metro Vancouver, the construction of separated bike lanes has been framed by some as a leftist conspiracy. This is totally unfounded. The fact that Calgary City Council was able to approve $7.5 million to pilot separated bike lanes gives me hope that places like Surrey and Langley could reallocate road space and built on-street separated bike lanes too. If you need proof that transit can work without City of Vancouver density, Calgary is the perfect case study. During peak periods there is light rail transit every 3 minutes. Light rail will get you to most parts of the City. Because light rail is so popular, Calgary is expanded all station platforms to be able to handle 4-car trains. For comparison, the Expo Line in Metro Vancouver can only handle 2-car trains. Banff Trail C Train Station Platform. 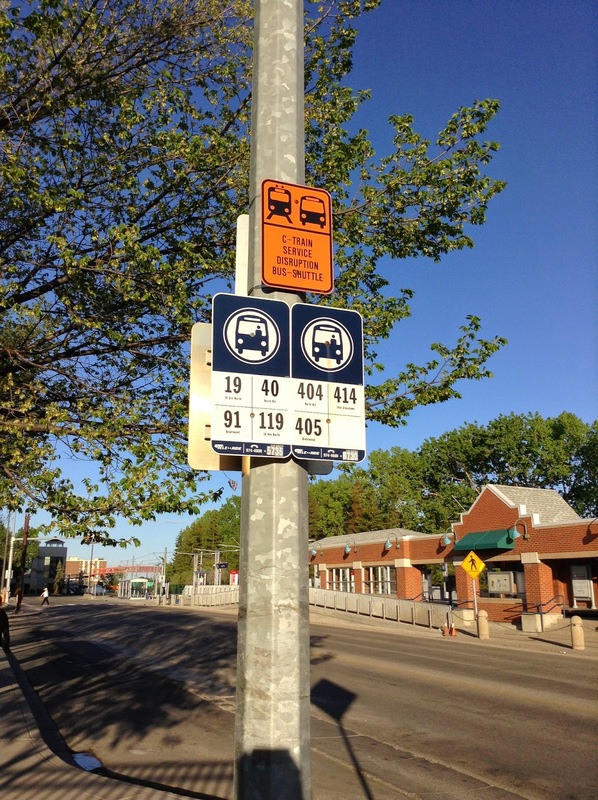 While TransLink is better than Calgary Transit when it comes to providing information online and on buses, there are some things that Calgary Transit does better. One of the things I find annoying in Metro Vancouver is that the majority of bus stop signs simply say “bus stop”. In every other region I’m been to in North America (outside of BC), transit agency put the bus route on these signs. This is extremely helpful and I have no idea why this does not happen in Metro Vancouver. Calgary Transit Bus Stop at Lion's Park C Train Station. Another thing that TransLink could learn from Calgary Transit is what to do when the rail transit system needs to be shut down. When an issue prevents the SkyTrain system from running, TransLink usually sets up replacement bus service. When this happens, it is usually poorly communicated and is unclear where to wait for replacement bus service. 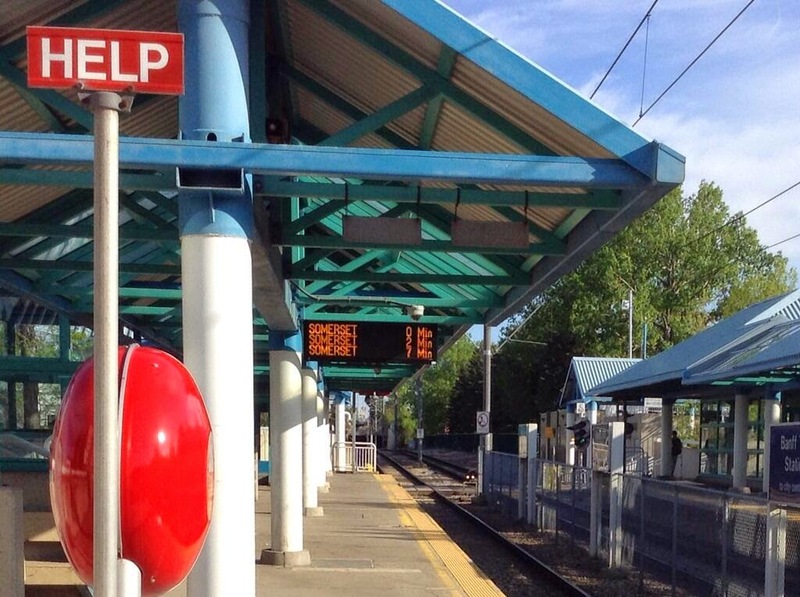 Calgary Transit marks where to wait for replacement bus service when there is a service interruption. While much of Calgary is still sprawled out single-family homes and strip mall, Calgary is become a more accessible city. While many of their light rail station are surrounded by parking lots, they are starting to be replaced by transit-oriented development. If Calgary continues to embrace accessible community design, it could be an example for other cities to follow if the City can control its sprawl. Earlier this year, I posted about a new project that is being proposed in what Surrey is calling the “Central Newton Cultural Commercial District.” As I noted at the time, the regional zoning would need to be changes from Industrial to “Mixed Employment”. The regional Industrial Zone allows “heavy and light industrial activities, and appropriate accessory uses” while the “Mixed Employment” zone allows anything but residential. The City of Surrey has a large section of industrial-zoned land along the Interurban/South Railway of BC corridor in the Newton area. While this land has been zoned for industrial uses for a long time, a number of factors have led to retail becoming established in the area. One of the primary reasons why is that Surrey allows “General Service” businesses, restaurants, and limited retailing in industrial areas. “Generals Services” includes things like photocopying services, film processing, rentals, appliance repair services, veterinary clinics, adult education institutions, banks, but not retail stores. While in a typical business park this sort of zoning would allow for restaurant that primary serve employees and allow manufactures to have a showrooms, many business-owner in the Newton area have stretch the definitions of allowed uses in the area. Some businesses are also operating out of the scope of their business license. 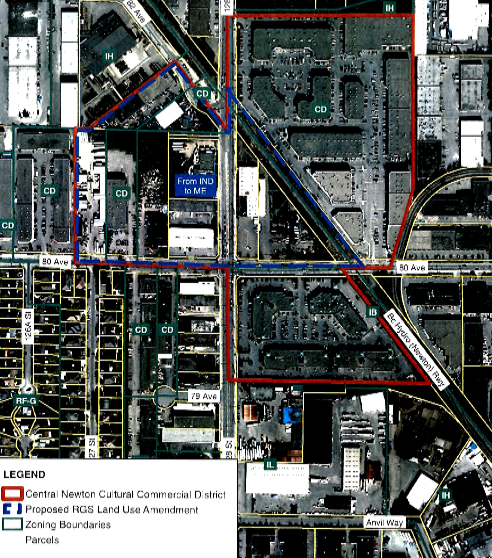 Proposed Central Newton Cultural Commercial District around the intersection of 128th Street and 80th Avenue. Over time, this has created a retail and office area that caters to the South Asian community in Surrey. The proposed creation of the “Central Newton Cultural Commercial District” is a way to recognize what is already happening in the area. By creating the zone, Surrey is hoping to direct future retail into this new district while at the same time strengthen the zoning to protect the surrounding industrial land from future retail/commercial uses. Surrey also plans to strengthen its bylaw enforcement in the area. By formally recognizing the “Central Newton Cultural Commercial District”, Surrey and TransLink will also be able to better plan and provision for roads, parking, walking, cycling, and transit service. Surrey is asking Metro Vancouver to change 6.5 ha from the regional Industrial Zone to the Mixed Employment Zone to support this district. As a minor amendment to the regional growth strategy, it will only need 50%+1 weighted support from the Metro Vancouver board to be approved. I think that Surrey is doing the right thing by embracing the current land-use in the area while putting provisions in place to protect the remaining industrial land in Newton.